Powers: Aside from the common unicorn powers, Steam can cut, fuse or weld together different materials, including skin. She can also form raw materials into finished products with a bit of magic, though she prefers sculpting them. 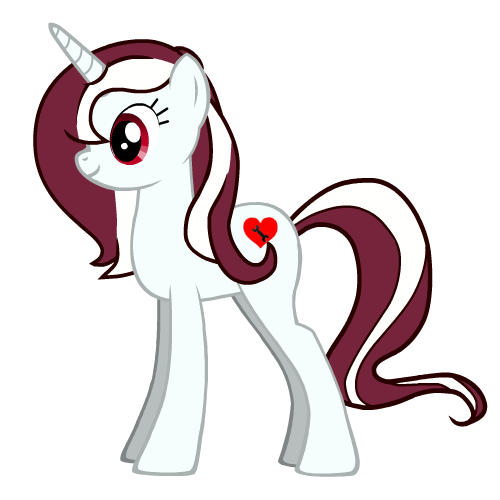 A bit taller than the average pony, she has smooth, dark red and white mane and tail, a dirtyish white coat, and scarlet eyes. Personality: Steam Heart is a loving and kind-hearted pony who likes to make things with anything she can find. She's just as good in taking care of other ponies as she is good in making strange and wonderful crafts, though she prefers doing the latter as opposed to be working as a nurse. She has a good sense of humor and doesn't mind roughhousing or getting her hooves dirty. History: Steam Heart had lived in Manehattan with her parents, who were into making lanterns and other kinds of crafts, wooden and metal. Inspired, she secretly made her own doodads. She learned how to use her magic to cut apart and weld together her materials. Her parents knew what she was doing and helped her along to be better in making things. Eventually she managed to be as good as her parents in making their art crafts. As she grew older, she felt that the big city wasn't for her. She had to meet impossible deadlines and the pollution in the air didn't exactly suited her tastes. So Steam decided to move to the country, where the air was cleaner and there was fresh grass she could feel under her hooves. After she and her parents decided to move to a countryside, she met with a little filly who ran away from home. The filly had a cut over over of her legs and she was crying because of the pain. Steam forgot to pack any emergency supplies so the was little she could do for the girl. Her cries were getting to her so she tried using her magic to close up the wound, using the same technique to bond her materials. The filly's cut had closed and her pain disappeared. Being so surprised that it worked, the filly had to point out that her cutie mark just popped out, which made Steam even happier. They took the filly back to her home and they were welcomed with open arms for bringing her back. They lived there until Steam decided she wanted to move again, feeling like there was something more out there. This time though, her parents stayed in the village. Eventually she made her way into the roads of Ponyville. Another good profile! Is this one ready? Because everything checks out with me! Awesome approved! I really love your characters. Thank you. I enjoy making up characters, and I'm happy that you like them so much.